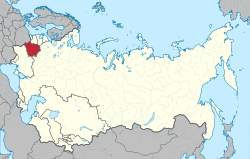 The Byelorussian Soviet Socialist Republic was one of fifteen constituent republics of the Soviet Union (USSR). In 1922, it was one of the four founding members of the Soviet Union. The other three were the Ukrainian SSR, the Transcaucasian SFSR and the Russian Soviet Federative Socialist Republic (RSFSR). Byelorussia was one of several Soviet republics occupied by Nazi Germany during World War II. The BSSR, along with the Ukrainian SSR and the Soviet Union, were founding members of the United Nations Organization (UN) in 1945. The end of the Soviet Republic occurred in 1991. The nation became an independent republic. Location of Byelorussia (red) within the Soviet Union. The country renamed itself as the Republic of Belarus. In earlier time periods, Western Europeans called Byelorussian territory as White Russia. During its early years in the USSR, the republic was sometimes known as the White Russian Soviet Socialist Republic.